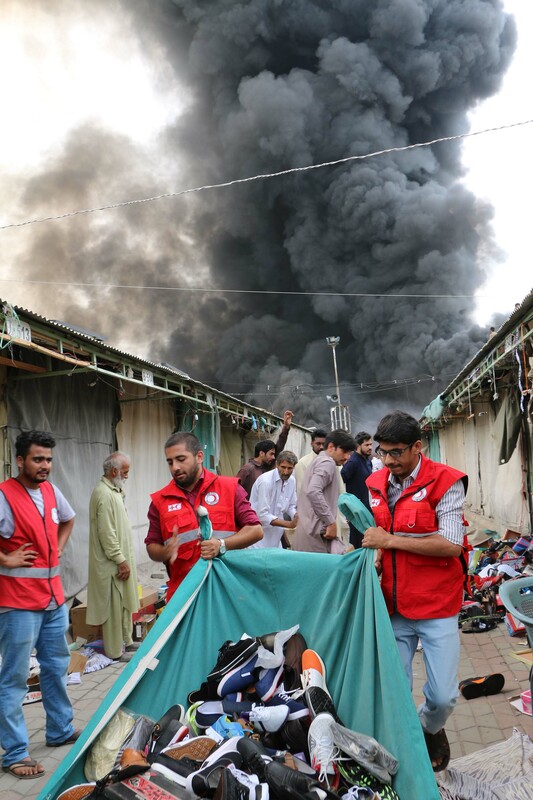 ISLAMABAD: The Pakistan Red Crescent Society (PRCS) response team along with the support staff rushed to the Sunday Market at Peshawar Mor on Wednesday where hundreds of stalls were completely destroyed by a huge fire. The exact cause of the fire is yet to be determined by the authorities concerned. A thick column of black smoke could be seen from miles off rising from the scene. The fire erupted at 11.09pm and quickly spread to the other stalls of shoes, clothes and other inflammable items and materials causing a massive financial loss to the stallholders. Luckily, there were no human casualties, as the bazaar was closed. Soon after the fire, the PRCS response team reached the site with three ambulances along with three first aiders, eight volunteers and five support staff along with officers from different departments. The team supported more than 20 traders in vacating their shops. First-aid was also provided to three traders and two firefighters after they inhaled the poisonous smoke. Later two persons were shifted to hospital when their condition deteriorated due to long exposure to smoke. Ninety smoke masks were also distributed among the firefighters, police, traders and the general people. A number of traders were also provided with psycho-social support service.